The longest-running show in Broadway history is back to TPAC, bringing the classic suspense and haunting music by Andrew Lloyd Webber it is known for. The Gothic romance stars Quentin Oliver Lee as the phantom, commanding all the mystery and wonder the “angel of music” should assume. Eva Tavares is Christine Daae, the gifted vocalist the phantom has taught and bestowed upon the gift of music. Sewanee University graduate Jordan Craig plays Raoul, Christine’s formidable fiance out to put an end to the phantom. Trista Moldovan as Carlotta and David Benoit as Monsieur Firmin bring the comedic relief to the otherwise intense show. Phantom is evocative and spooky, with cobwebs surrounding and covering the stage in the opening scene that is sure to put anyone in the Halloween spirit. But Phantom isn’t just a needed see for the season only. The historical show is one of the most famous and award-winning musicals, winning 70 major theater awards, including seven Tony Awards (including Best Musical) in 1988 and three Olivier Awards in the West End. Total revenues for Phantom exceed the world’s highest-grossing film Avatar ($2.8 billion). An interesting facet of this production in particular is that it hired 75 local Nashville stagehands to load the production into the theatre, and 35 local stagehands were hired for the performance. The most spectacular part of the entire stage production is the chandelier, as this production’s version is especially remarkable and even bigger and more elaborate than in years’ past. Designed by Howard Eaton (who designed the Olympic rings for the London ceremony), the chandelier boasts over 6,000 beads and weighs 1 ton. The massive, beautiful object hangs over the audience in the center front orchestra level, glittering marvelously while suspended forebodingly. More-so than anything, the stage production is the highlight of Phantom. The intricate and large sets feature a number of moving parts, with colorful costumes for the opera stars contrasting with the Phantom’s dark exterior, giving audience members always something visually breathtaking to look at. The sets, as well, offer contrasting scenes full of color in the Opera House with nighttime, “underground” scenes in the Phantom’s lair. 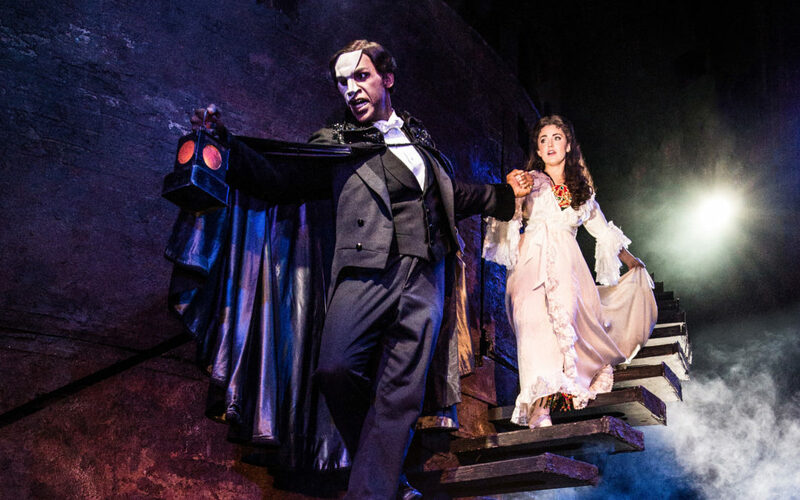 Familiar lovers of the show and newcomers (like myself) will be captivated by Christine and the Phantom’s relationship and the overall weird and eerie-vibe of this new production. Students who have yet to witness the dazzling stage production that Phantom is need to catch the show while it’s in town for its 10-day run. This is the first Phantom to tour the U.S. in three years.